There is a lot of discussion these days surrounding employees taking time off. 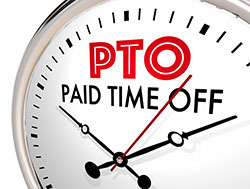 Specifically, a number of organizations have enacted "Unlimited Paid Time Off (PTO)" as company policy. No limit to vacation days ... for all of their employees. If this concept is foreign to you, it's reasonable to ask how these companies meet their quarterly objectives, and finish the fiscal year above and beyond their goals. But although there can be setbacks, I want to give you a few reasons why Unlimited PTO might be an interesting conversation to drum up with HR ... all you'll need to bring is a cup of coffee and wide open mind. If a focus of yours is hiring top-tier talent (specifically the millennial type: ages 23-38), then Unlimited PTO on a job description will stick out like the sorest of thumbs ... in a good way. Now, contrary to popular belief, that's not because millennials are lazy and just want to have a good time. Millennials live in an age of comparison and see their friends and families experiencing (what seems like) endless time off traveling and having a blast. Why wouldn't they want that kind of freedom? When new hires know they have freedom to take time off when they want (and when they need), a relieving sense of pressure might invigorate their work efforts ... all year round. The idea is to rest and recoup so their minds are fully focused when on the job. Think about it: does Unlimited PTO convey trust or mistrust in your employees? Unlimited PTO takes pressure off employees for when the unexpected happens, as well as momentous occasions they don't want to miss. Unforeseen hospital visits, for themselves or loved ones, are worrying enough. But losing their paid time off as a result adds a new level of worry when their focus should be on family. In addition, when time off is limited, stress may plague employees in regard to which events they'll attend, and which friends/family will get burned by their absence. This also hints at the concept of "filling in gaps". Do your employees have the willingness to fill in gaps when other employees are gone? You might call it willingness ... or humility. Something to think about in regard to your work culture. Start thinking about this whole concept as purely "life balance" with passionate work as a part of it. Sure, granting your employees Unlimited PTO is a sign of trust. And if you worry about their "responsibility" in the matter (taking advantage of Unlimited PTO before getting their job done), then perhaps something greater is at stake: a hiring issue. What are your thoughts? Does the idea of Unlimited PTO make you jump to financial ramifications, and how your Salt Lake County business might suffer? Does your company already implement this rule, or does it make you wonder how things might change as a result? Not saying one way is more perfect than the other ... perhaps I'm just shuffling things around in an effort to stir the Unlimited PTO POT. Feel free to share this post with a business associate or client you know who could benefit from our assistance.